Platform, Aluminum, Extra Heavy Duty, 15' inside pole face to face, 42" wide. Attaches with six 3/4" machine bolts (three in each pole). Platform, Aluminum, Extra Heavy Duty, 17' inside pole face to face, 42" wide. Attaches with six 3/4" machine bolts (three in each pole). Platform, Aluminum, Extra Heavy Duty, 13' inside pole face to face, 42" wide. Attaches with six 3/4" machine bolts (three in each pole). Platform, Aluminum, Extra Heavy Duty, 21' inside pole face to face, 42" wide. Attaches with six 3/4" machine bolts (three in each pole). Platform, Aluminum, Extra Heavy Duty, 19' inside pole face to face, 42" wide. Attaches with six 3/4" machine bolts (three in each pole). Platform, Aluminum, Extra Heavy Duty, 19" inside pole face to face, 42" wide. Attaches with six 3/4" machine bolts (three in each pole). Platform, Aluminum, Heavy Duty, 18' inside pole face to face, 42" wide. Attaches with four 3/4" machine bolts (two in each pole). Platform, Aluminum, Heavy Duty, 18' inside pole face to face, 42" wide. Attaches with four 3/4" machine bolts (two in each pole). Includes 41" wide walkway on one side with supports and hand rails. Platform, Aluminum, Heavy Duty, 14' inside pole face to face, 42" wide. Attaches with four 3/4" machine bolts (two in each pole). Platform, Aluminum, Heavy Duty, 16' inside pole face to face, 42" wide. Attaches with four 3/4" machine bolts (two in each pole). Platform, Aluminum, Heavy Duty, 16' inside pole face to face, 42" wide. Attaches with four 3/4" machine bolts (two in each pole). 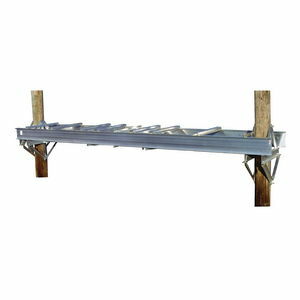 Includes 41" wide walkway on one side with supports and hand rails. Platform, Aluminum, Heavy Duty, 14' inside pole face to face, 42" wide. Attaches with four 3/4" machine bolts (two in each pole). Includes 41" wide walkway on one side with supports and hand rails. Platform, Aluminum, Regular Duty, 14' inside pole face to face, 42" wide. Attaches with four 3/4" machine bolts (two in each pole). Platform, Aluminum, Regular Duty, 12' inside pole face to face, 42" wide. Attaches with four 3/4" machine bolts (two in each pole). Platform, Aluminum, Regular Duty, 16' inside pole face to face, 42" wide. Attaches with four 3/4" machine bolts (two in each pole).